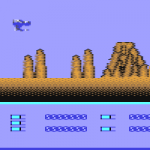 05/12/14 – Trevor Inns confirms details about the C64 conversion and what happened. The Great Space Race was to be a huge game across many platforms, especially after the success of Valhalla by Legend. 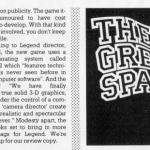 The game was advertised quite heavily with large black space backgrounds with text “The Great Space Race” in large white lettering. For ages people waited for the game, and eventually it was released on the ZX Spectrum and people were very disappointed overall. It wasn’t quite the mega game that people were expecting, and people felt very let down. Legend tried to rectify things later with some other games which were pretty good – but sadly the damage was done and eventually they faded away. 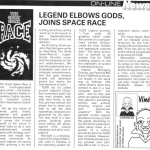 According to Home Computer Weekly, The Great Space Race was also to be released on the Commodore 64 – but as you can probably tell, this didn’t quite happen for reasons unknown. It is possible that the C64 version was running late after the Spectrum version, they saw the failure of the game on that platform and decided to scrap the C64 version. Or did it even get started at all?? We got hold of Trevor Inns, who tells GTW64 that the game was originally being developed alongside the Spectrum edition. As things were beginning to fall behind due to this, they decided to focus on the Spectrum edition first and get that finished to ensure it was released asap. After the game so spectacularly failed commercially, they decided to shelve the C64 edition. As a result, it means that there is a C64 conversion partically complete out there – but we’re not sure if it will ever be found. According to Trevor, the developers would have been the same as the Spectrum edition, so we’ll continue to dig to find out more!